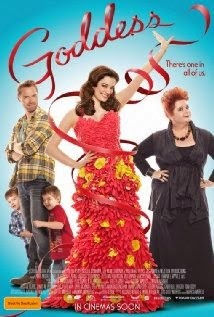 Goddess is a 2013 romantic comedy film starring Ronan Keating, Laura Michelle Kelly and Magda Szubanski. Elspeth Dickens (Laura Michelle Kelly) dreams of finding her "voice" despite being stuck in an isolated farmhouse with her twin boys. A webcam she installs in her kitchen makes her a cyber-sensation. While husband James (Ronan Keating) is off saving the world's whales, she is offered the chance of a lifetime. But when forced to choose between fame and family the internet goddess almost loses it all. Goddess is directed by Mark Lamprell and was filmed in 2013 in Sydney, Australia and Tasmania. The film is based on the original stage play Sinksongs, written and performed by Joanna Weinberg with music for the film written by Joanna Weinberg, Bryony Marks and Jude Morris.